Chemistry, a European Journal, 2016, 22, 17776–17783. First published online 27 October 2016. Despite the fact that extensive research has been carried out, the oxygenation of alkyl magnesium species still remains a highly unexplored research area and significant uncertainties concerning the mechanism of these reactions and the composition of the resulting products persist. This case study compares the viability of the controlled oxygenation of alkylmagnesium complexes supported by β-diketiminates. 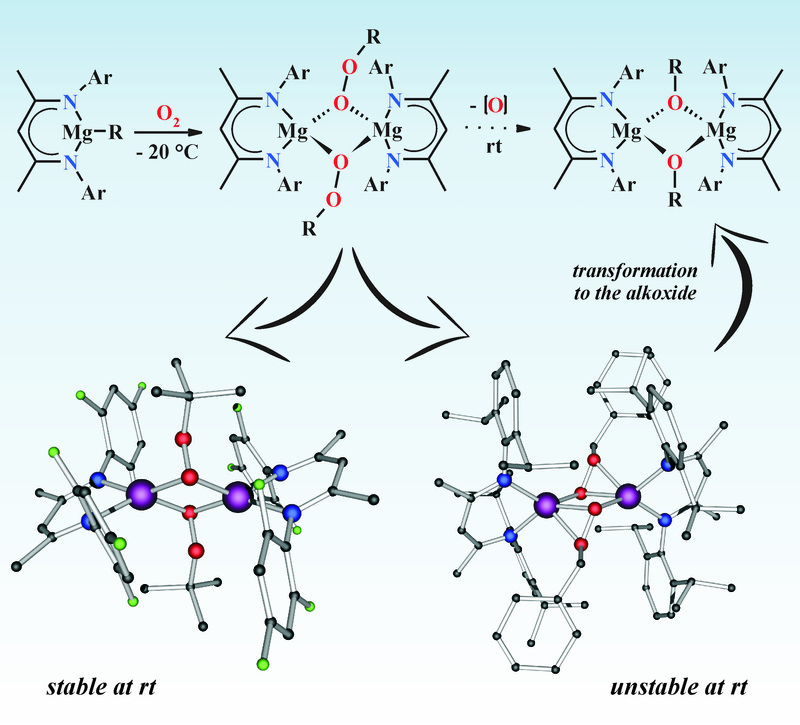 The structural tracking of the reactivity of (N,N)MgR-type complexes towards O2 at low temperature showed that their oxygenation led exclusively to the formation of magnesium alkylperoxides (N,N)MgOOR. The results also highlight significant differences in the stability of the resulting alkylperoxides in solution and demonstrate that [(BDI)Mg(μ-η2:η1-OOBn)]2 (in which BDI=[(ArNCMe)2CH]− and Ar=C6H3iPr2-2,6) can be easily transformed to the corresponding magnesium alkoxide [(BDI)MgOBn]2 at ambient temperature, whilst [(F3BDI)Mg(μ-OOtBu)]2 (in which F3BDI=[(ArNCMe)2CH]− and Ar=C6H2F3-2,4,6) is stable under similar conditions. The observed selective oxygenation of (N,N)MgR-type complexes to the corresponding (N,N)MgOOR alkylperoxides strongly contradicts the widely accepted radical-chain mechanism for the oxygenation of the main-group-metal alkyls. Furthermore, either the observed transformation of the alkylperoxide [(BDI)MgOOBn]2 to the alkoxide [(BDI)MgOBn]2 as well as the formation of an intractable mixture of products in the control reaction between the alkylperoxide [(F3BDI)MgOOtBu]2 and the parent alkylmagnesium [(F3BDI)MgtBu] complex are not in line with the common wisdom that magnesium alkoxide complexes’ formation results from the metathesis reaction between MgOOR and Mg−R species. In addition, a high catalytic activity of well-defined magnesium alkylperoxides, in combination with tert-butyl hydroperoxide (TBHP) as an oxygen source, in the epoxidation of trans-chalcone is presented.